In the present economy, it’s easy to pull money from your grocery budget to cover other things but I’m here to tell you that it’s not necessary! Yes, I do spend more than the average American on groceries, but considering that the average American only spends about 9-12% of their income on food, as compared to 1949’s figure of 22%, or the current European average of 14-17%, or even Pakistan’s current average of 46%, I don’t consider my food bill to be exorbitant. It matters to me, so I make room for it in my monthly spending plan. You can too, with some tricks like this one: how to make 3 meals from 1 chicken. This recipe is a bit labor-intensive, so choose your own best day for it – weekends if you work outside the home, or Monday to start off a nutritious week if you have the afternoon relatively free (you don’t have to be in the kitchen the entire time, but you do need to be nearby). 1. Place onion slices in the bottom of your roasting pan. Cut heads of garlic in half and place, cut side down, in pan. Stuff fresh herbs into the cavity of the chicken and place on a rack in the roasting pan, underside up. Brush with melted butter or coconut oil, and sprinkle with sea salt and pepper. *Newbie alert: When you buy a whole chicken, it almost always comes with a bag of innards stuffed inside. Fish around until you find it and if you don’t, be very sure you have fished thoroughly! This reminder brought to you by the person who didn’t do this the first time around. 2. Bake at 375 degrees for 1 hour. 3. Turn chicken: place a wooden spoon into the cavity, lift and rotate so the top side is up. Brush with more butter or coconut oil, season with salt and pepper and return to the oven for another hour. 4. Remove chicken to a carving board or other surface, and cut into individual pieces. 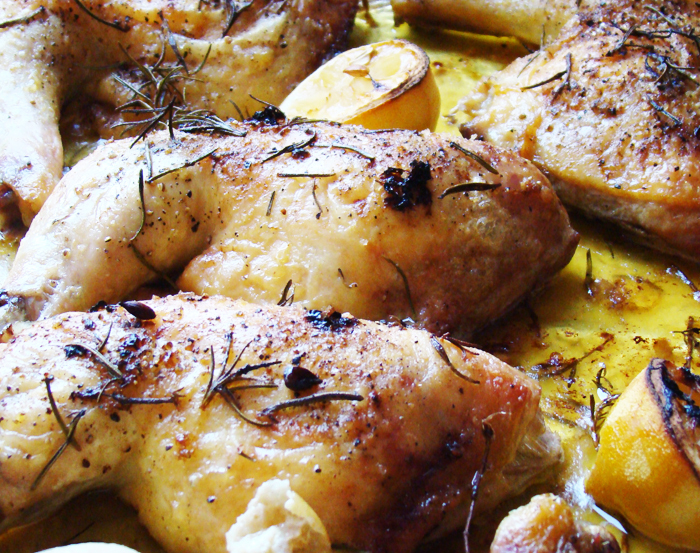 Serve chicken pieces and garlic heads, or place into a warm oven while you make the sauce. 5. Using roasting pan with onion slices caramelized on the bottom, pour in wine and bring to a boil, stirring to loosen onion slices. Add stock (and gelatin) and continue boiling until liquid is reduced by half. Strain into a small saucepan and serve on the side. After you have finished meal #1, separate remaining meat from the bones and reserve meat in the fridge, and bones in the freezer. Take that reserved meat from the fridge, and use it for anything you like! I prefer to top a nice big salad with it, while Eric loves to have soft tacos. If you’re going for the tacos, I like to spice it up first. Here’s how! 1. Blend all spices including salt in a small bowl. Heat skillet to medium-high heat, and add spices to roast for about 15 seconds. This will release oils and flavors. 2. Add coconut oil and onions and cook for a couple of minutes, stirring often, until onions start to become transparent. 3. Add shredded chicken and toss liberally in onion-spice mixture, until chicken is warmed and coated with spice blend. You might add a little more oil as needed. Serve on corn tortillas with lettuce, guacamole, sour cream and salsa. Nom! Use those bones that you reserved from Meal #1 to make a nutritious soup full of the good things that I talked about in yesterday’s post, Bone Broth 101. Combine all ingredients in a stockpot and bring to a boil, then lower heat to simmer (you should see a bubble every 2-3 seconds, not a constant stream of bubbles) for 3-4 hours. If you added chicken breasts instead of the remaining shredded chicken, simple slip the bones out at the end and pull apart the chicken. Serve with slices of sourdough bread, or Coconut Flour Bread if you are gluten- or grain-free. Voila! Do you know some tricks for stretching your food dollar? Share them here! That’s right – thanks! I just made some mayonnaise and plan to do a mayo-based chicken salad later in the week. If you have a recipe that you love, please post it! I once got 6 meals for 2 of us from one chicken. Can’t remember what they were, but at least 2 of them were soup.